Sri Lanka's government declared a state of emergency on Tuesday, after violent clashes between ethnic Sinhalese and ethnic Tamils began to spread, eight years after the end of an extremely violence civil war between the two ethnic groups. On February 22, a (Buddhist) Sinhalese truck driver was assaulted by four (Muslim) Tamil youths at a filling station in Digana, Kandy, in Sri Lanka. The truck driver died on Saturday. The funeral was held in Digana on Sunday. During the funeral procession, the Sinhalese began attacking Tamil-owned shops and properties, setting some shops on fire. More than 30 shops and houses were damaged, and dozens of mosques were attacked. 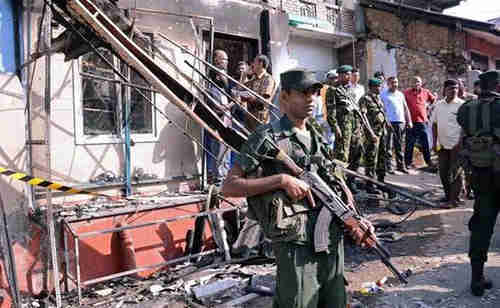 Clashes between Tamils and Sinhalese erupted all over the region on Monday, and in other Sri Lankan cities as well. The police imposed a curfew on Monday evening. On Tuesday, Sri Lanka's president Maithripala Sirisena declared a nationwide state of emergency for seven days. Under the emergency, security forces can carry out searches without warrant and detain suspects without charges. There has been growing tension and violence between the Sinhalese and Tamil communities, with some hardline Buddhist groups accusing Muslims of forcing people to convert to Islam and vandalizing Buddhist archaeological sites. The Buddhists have also accused the Muslims of refusing to use condoms, so they can have more babies. It also appears that Buddhist hardliners in Sri Lanka are being influenced by the genocide by Myanmar (Burma) against Rohingya Muslims. That genocide is being led by Buddhist monks, particularly Ashin Wirathu, a Buddhist monk who turned "969" from a Buddhist sign of peace and happiness into a sign of bloody genocide and ethnic cleansing. It's only been eight years since the end of the civil war, but we're seeing the very early stages of something that I've described as occurring sooner or later in every country following the end of a generational crisis civil war between two ethnic groups. Among generational crisis wars, an external war is fundamentally different than an internal civil war between two ethnic groups. In an external war, one country's army invades another country. When the war ends, the invading army leaves, and the two countries continue relations through the United Nations or international or bilateral treaties. But when an internal civil war between two ethnic or tribal groups occurs and then ends, then the people who killed, tortured, mutilated and raped each other still have to live with each other, often in the same villages, sometimes on the same street. And so the extreme trauma and bitterness of war continues, even though the war has ended. That's clearly what we're seeing in Sri Lanka. Furthermore, as the young babies and children who weren't really aware of the war grow older, they become aware of how much they hate each other, and the violence only grows. I've written articles about what happens to such countries as the decades pass and new generations grow up during generational Awakening and Unraveling eras. The leaders of the winning side refuse to step down, and start using violence and atrocities against civilians to stay in power. These include Paul Biya in Cameroon, Pierre Nkurunziza in Burundi, Paul Kagame in Rwanda, Yoweri Museveni in Uganda, Robert Mugabe in Zimbabwe, Joseph Kabila in DRC, or, outside of Africa, Bashar al-Assad in Syria and Hun Sen in Cambodia. This has already started in Sri Lanka. Mahinda Rajapaksa was elected president in 2005, but lost the election in 2015. He tried to get the army to overturn the election results, but didn't succeed in that. But we can certainly expect to see more of that in the future. "North Korea made clear its willingness to denuclearize the Korean peninsula and the fact there is no reason for it to have a nuclear program if military threats against the North are resolved and its regime is secure." So North Korean officials have thought about nothing else but nuclear weapons and ballistic missiles for decades, but now they're willing to give them up for some promise of security? I don't think so. There's nothing that the US could do to guarantee that would cause the North to say: "OK, now I agree that the military threats are resolved, and the regime is secure." The North Koreans could make demands -- withdraw all troops from South Korea, withdraw all ships from the region, close all military bases around the world, etc., etc., but there would always be new demands. So the whole promise is a scam.